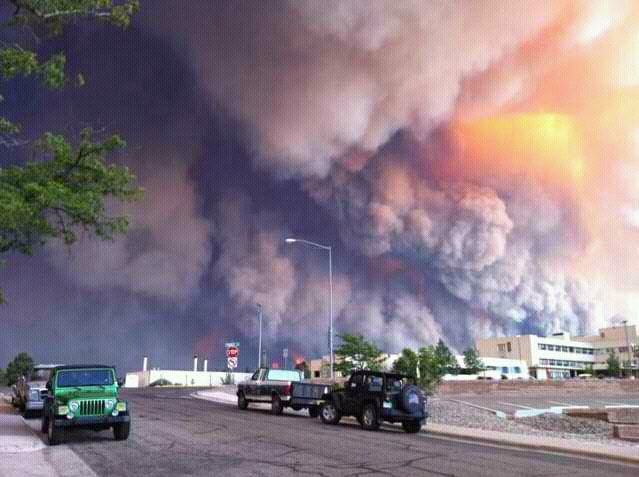 New Mexico is burning. After several years of drought, the desert is ripe for fire and as of right now there are two big plumes of smoke on my horizons: the Pacheco fire burning in the Sangre de Cristo Mountains above Santa Fe and the Las Conchas fire currently roasting Los Alamos. Yesterday evening I hiked up to my old place up on the mesa to get a better look at the Las Conchas fire burning 30 miles away across the valley in the Jemez Mountains. Judging from the haze of smoke at my place and the increasingly ominous news reports I knew it was bad, but nothing prepared me to see the entire horizon consumed in smoke. In the past 48 hours the Las Conchas fire has exploded to more than 60,000 acres and is still zero percent contained. Bandelier National Monument has already burned and mandatory evacuations have been issued for Cochiti and Los Alamos, home to 12,000 people and Los Alamos National Labs, one of the largest nuclear research facilities in the US. This isn’t the first fire to strike Los Alamos. In 2000 the Cerro Grande fire burned 48,000 acres, including 400 homes in Los Alamos, causing more than 1 billion in damages. Now many of the same people who lost everything in 2000 are being forced to evacuate again. Evacuees are urged to remember the six P’s: people, personal computers, pets, pills, papers and pictures. A reverse-911 call is the signal to leave. I can’t imagine what it must be like to pack your car knowing everything you leave behind might be reduced to ashes. a few times. The town is not large, but it does have the distinction of being one of the best educated communities in the US with more PhD’s per capita than almost anywhere else. Nuclear research is ongoing there and on the way into town all cars must pass through a government inspection station. I guess they might stop large trucks, but I must not look suspicious because I have always been waved through, no questions asked. I do wonder how fire will affect the cliff cave dwellings at Bandelier or the spectacular sport climbing areas on Cochiti Mesa. Fire is a powerful weathering agent of rocks. Extreme heat rapidly expands outer layers of rock, leading to fracturing and spalling. “Fire spalling” affects nearly all types of rock including the hard igneous rocks, quartzites, and flints found in the Jemez Mountains. 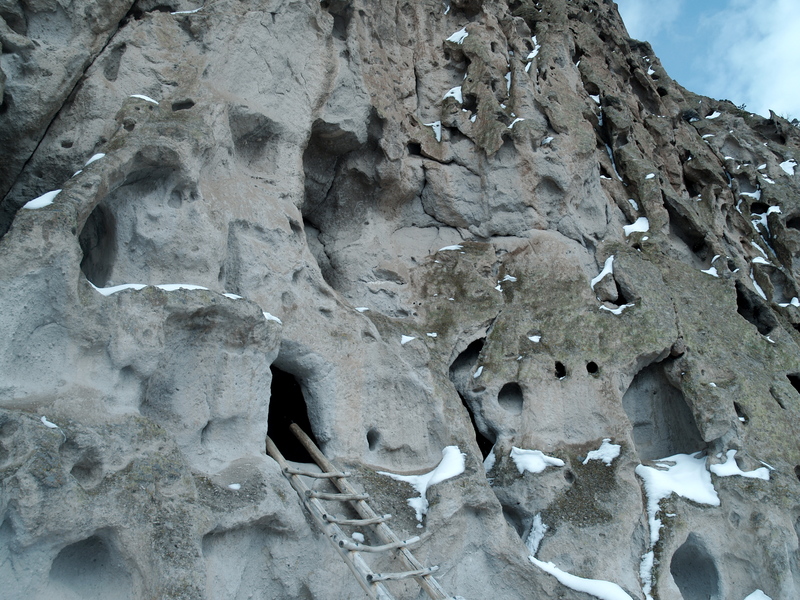 The cliff caves at Bandelier were occupied by the Ancestral Pueblo People for an incredible 450 years from 1150 until the early 1600’s. The dwellings are dug out of thick layers of volcanic tuff, deposited 1.47 and 1.15 million years ago during the last major eruptions of the Valles Caldera supervolcano, ten miles northwest of Bandelier. Volcanic tuff is highly susceptible to fire spalling and weathering and archaeological studies have found evidence for multiple episodes of fire damage at the cliff caves and ruins at Bandelier. Sitting on the edge of the South Mesa, watching the sunset light up the smoke billowing from the Jemez Mountains, I remind myself that fire is not evil. It’s a part of life. Fire has come to the Jemez but those woods and rocks have burned before and they will burn again. 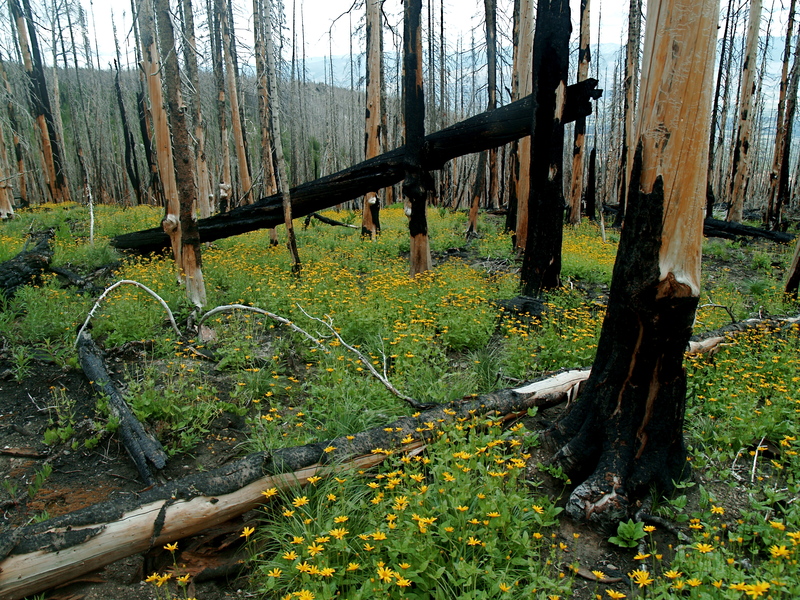 Someday, I will return for a hike among blackened trees and rioting wildflowers. From fire, life springs eternal. ** For years I’ve been wondering whether hurricanes are restorative to coastal ecosystems the same way that fires are to forests. I have asked several experts, but nobody has given me a good answer.